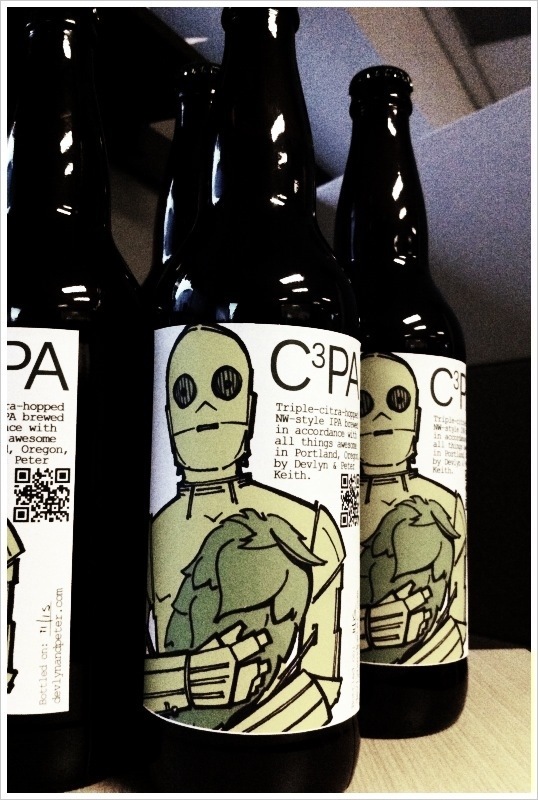 C^3PA is an intensely hoppy and citrusy IPA, brewed in Portland, Oregon by Devlyn and Peter Keith. Triple-hopped with only Citra hops, it is a relatively simple beer to brew, and is ridiculously tasty — so much, in fact, that it’s become one of our standards. We should always have a keg of this in the kegerator. We cannot, however, take ownership for the recipe. The original can be found here, at Bader Beer & Wine (very handily, where Peter works some weekends). This entry was written by devlyn, posted on November 16, 2011, filed under Brew and tagged beer, C3PA, Citra, hops, IPA. I saw the site is amazing congratulations! Are you sure it’s an oversized hop, and not an undersized character-that-looks-very-much-like-but-is-not-C3PO? Ed, why do you hate art so?